Two people were injured in the shooting, which occurred outside the Stadium while an underage boxing event was underway. 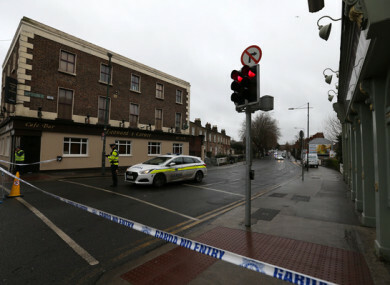 Gardai at the scene of the shooting yesterday. GARDAÍ HAVE APPEALED for witnesses or anyone with information to come forward in relation to a shooting at the National Stadium in Dublin on Friday night. One of the injured men – who is believed to have been the intended target of the shooting – is aged in his 40s and known to gardaí. The second victim is believed to be a student with no links to crime. Neither man received life-threatening injuries in the attack. Investigating gardaí are appealing to members of the public who may have any information in relation to the incident or who may have been in the area of South Circular Road or St Alban’s Road in Dublin 8 between 8pm and 10pm on Friday night. In particular, gardaí want to talk to anyone who may have seen a black or dark coloured Lexus car which was reported to have been in the area at the time. Gardaí also want to speak to any drivers who have dashcams fitted to their vehicles who may have been in the area at the time. An incident room has been established at Kevin Street Garda Station and gardaí wish to appeal for witnesses or to anyone who can assist with the investigation to contact Kevin Street Garda Station on 01 6669400, the Garda Confidential Telephone Line 1800 666 111 or any garda station. Email “National Stadium shooting: Gardaí looking for dark coloured Lexus car”. Feedback on “National Stadium shooting: Gardaí looking for dark coloured Lexus car”.